I have been enjoying tamarind flavors in a number of Indian and Thai dishes for years, but until recently it had not occurred to me to attempt to use tamarind in anything myself. Last year, I was making a recipe that called for tamarind concentrate. We used it in a few dishes (and a few cocktails), and when I recently stumbled upon a bag of dried tamarind pods in a local international market, I decided it was finally time to figure out how to really use this lovely fruit. Now, I am certainly not an expert on how to properly use tamarind. So for those of you who are, feel free to chime in on how I should have prepared this fruit. First I cracked off the hard, outer pod. Then, inside the fruit are very large seeds which I removed. Although I probably could have infused the fruit at that point, I thought reconstituting the fruit a bit might help bring out the flavor. So I added some water and heated it on the stove (as above). It isn’t very pretty at this point, but it has that lovely, tangy flavor. Combine the tamarind flesh and 1/2 cup water in a small sauce pan and place on stove. Bring to a boil, then reduce heat and simmer for about 3-4 minutes, or until most of the water has either soaked into the flesh or evaporated. Remove from heat and let it cool. After the tamarind cools, combine all ingredients in a jar, shake and let sit in a cool area for a few weeks. We let this infuse for about 3 weeks, but it seemed to infuse pretty quickly. You could probably do this in two weeks, or even use a bit more gin. Strain and filter through a strainer, cheesecloth or jelly bag, and finally a coffee filter. Don’t let the tamarind intimidate you! I’m so pleased with how well this infused and how easy it was, we will make more tamarind infusions as well. 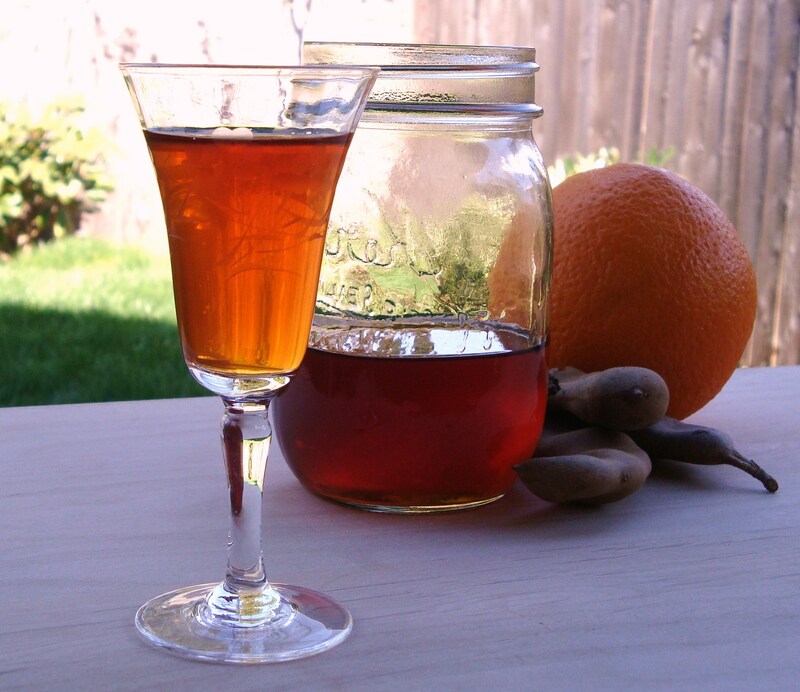 Categories: Infusion, Liqueur, Recipes | Tags: gin, Liqueur, orange, recipe, tamarind | Permalink. What an awesome blog – I’m going to start trying it all, not all at once though! wow i love this idea ~ i’m wondering if using brandy would make a grand marnier type flavor. i know i’ve had tamarind and liked it… but can’t recall what it tastes like! I think brandy would be great. The flavor will be more tangy than grand mariner because of the tamarind. 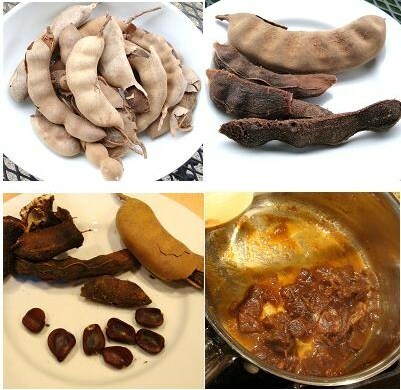 Many people say that tamarind is very sour. There are different varieties, and I think the one I used was not incredibly sour, but very tangy. I love it! And I hope you do too. Another great recipe! I love tamarind! Love this! I never knew what those things were called! Learn something new everyday 😉 From having it before in Indian dishes, I can see how it would work well with the orange + gin. Thanks. I had tried a tamarind shrub, which really made me want to experiment with more tamarind beverages. thanks for the recipe. did you try to strain out the tamarind pulp or leave it in there? Sorry I forgot that part! I did strain out the tamarind pulp. I went back and edited the post to include that step, and have added a link to my post about straining and filtering liqueurs. Thanks! What a great idea! In Costa Rica they make cold beverages from tamarind pulp (pre-packaged pulp), water and sugar. It’s really tangy and refreshing on hot days, so I imagine this gin is great for refreshing tangy cocktails. Could this be made with any other type of liquor? Yes, and yes. The infusion was tangy and tasty. It wasn’t as sour as I thought I might be. But it was really delicious. I have only made this one infusion with tamarind, but I think it would infuse well in almost a anything. You could try vodka, bourbon, rum, brandy. And I think there are a lot of different things you could try combining with the tamarind. It infused fairly quickly. I recently gave this a try, making a batch perhaps slightly stronger than the original. The result was delicious but I struggled a bit in playing around with drink recipes. It was a little too intense and sour to be the primary source of alcohol in a drink but not intense enough to be just a one shot flavor addition. Then I tried it as a base in a martini with some home made ginger liqueur, some vermouth, and orange bitters. Absolutely fantastic. Gonna have to make the second batch a double I think, this one won’t last very long! That is interesting, mine didn’t turn out nearly as sour as I thought it would. Maybe it is because yours was stronger, or maybe there are different types of tamarind? It did infuse very quickly and I think you could even go lighter on the tamarind. I love the Tamarind whiskey sours at a local restaurant, and this drink was (althought not the same) reminiscent of it and very delicious. Just finished straining my first batch of this and had a tamarind gin and tonic. It is soo good! Thanks! !